PHILADELPHIA, PA – Henry McCain, a graduate of Paine College and Temple University, departed this life on Memorial Day, May 28, 2012 in Philadelphia, Pennsylvania at the age of 67. Henry was funeralized on Saturday, June 9, 2012 at 10:00am at the Bright Hope Baptist Church in Philadelphia and the interment was on June 11, 2012 at noon at the Ivy Hill Cemetery in Philadelphia. Henry, the son of the late Johnnie Walker & Emma E. McCain of North Augusta, South Carolina and the father of the late Jonathan McCain, is beloved by his family, wife and business partner: Dorothy (Dottie) Nabrit McCain; children: Henry James McCain, Jr., Deacon Marcus McCain, Minister Yolanda McCain, and Joshua McCain; grandchildren: Taylor and Daniel McCain; siblings: Juliana Gardenhire, Minister Walker McCain Jr., Lewis [Elaine] McCain, Dr. Thomas [Belinda] McCain, Moses McCain, Dr. Emma McCain, and Queen McCain [Ronnie] Harrison, a host of nieces and nephews, and many friends and associates in the educational and business arena. Henry was also the youngest brother of Dr. Thomas C. McCain, who was former Edgefield County Administrator for 10 years. Henry was born and reared in Edgefield County. He always credited his educational success from the early childhood matriculation he received in Edgefield County public schools. Henry graduated early (after only three years in attendance) from Edgefield County High School. His parents, as mentioned in the above article, were also from North Augusta (Edgefield County), South Carolina. Henry graduated from Paine College with a B.S. in Mathematics in 1967, attained the Ed.M. 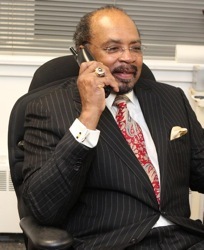 in Curriculum & Instruction from Temple University in 1971 and a certificate in Secondary School Administration from Temple University in 1974, and taught high school mathematics in the Philadelphia School System for 17 years before developing his own business, Henry & Dottie McCain, Associates, through Primerica Financial Services, where he was National Sales Director, OSJ. Henry had a compassion for service to his family and friends and to his church and local community. As a member of the Bright Hope Baptist Church, he was involved in the following ministries: Board of Trustees, Celestial Choir, Health Academy and College Tour Coordinator, and Tutor in Physics, Calculus, Trigonometry and all areas of Mathematics. Many youth have testified of the influence that he had on helping them pass the SAT and AP exams, as well as graduate from high school and college. Henry also served as president of the Finley Playground Advisory Council of the City of Philadelphia and president of the Philadelphia Chapter of Paine College Alumni Association and was a member of the Prince Hall Grand Lodge – Mt. Olive #27 and the Kappa Alpha Psi Fraternity. Following his being healed from a stroke in 2006, Henry’s passion to share this testimony with others led to his completing a Master’s Degree from the Palmer’s Theological Seminary in 2011 and becoming a Minister of the Gospel wherein he shared the word of God with many. Henry was a great fan and beam of light within the McCain family and for the many other lives he touched and changed. 5 Responses to "Henry James McCain, Sr."
Thanks for sharing the highlights of the life and accomplishments of my brother, Henry McCain, Sr., with our local community. Please keep all of us,his family members, in your daily prayers! My heart is touched by the beautiful tribute you gave my darling husband, Henry. Thank you! Thank you so much for paying tribute to my father. Thank you for this tribute. Words can’t express how much of an asset my father was to our great family. Reading this brought a smile to my face. What a legacy! Henry was a friend to me during my time @ Palmer. He invited me to Yolanda’s initial sermon, which I was thrilled to attend. This is a wonderful tribute.